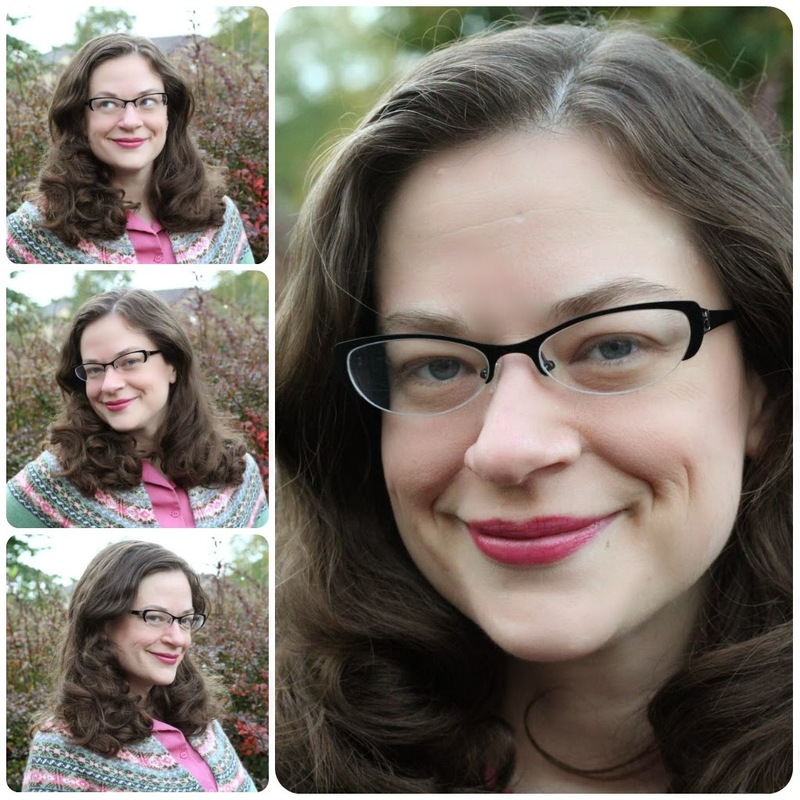 So happy to show you all my new retro-inspired specs! I used to wear contacts all the time and then would switch to glasses (a very outdated pair--bad, I know) for lounging around the house at the weekends or at the end of the day. But I found myself wearing those outdated glasses for longer stretches of time and knew that it was time to get some new glasses! I also knew I wanted a pair of retro-inspired glasses. This pair is from Boots Opticians and is from their own line. What do you think? I also picked up a lovely fair isle sweater from the Edinburgh vintage store, W. Armstrong & Son. I got it for super cheap because it was missing 4 buttons. Easy fixin'! I got some cute peach coloured buttons and but those on instead! I love Fair Isle and someday I will get around to learning how to knit...until then, I'll keep scouring the vintage shops for these gems! 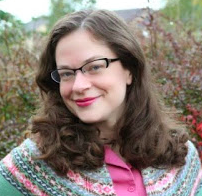 A lovely reader recently shared some local history of the Fair Isle knit with me. Part of the popularity of Fair Isle knitting in the '40s had to do with rationing since regular knitting yarn was rationed but skeins of darning wool were exempt. Here's a neat page of some first-hand testimony of rationing from the BBC website. Your glasses are pretty and frame your face so well! Love your hair and sweater in the picture too! And about information on Fair Isle knitting: I saw the series 'Fabric of Britain' on BBC 4. The first episode was about knitting and devoted quite a bit of attention to Fair Isle. Maybe you can still view it on BBC I-player? I love your new specs, Debi! So perfect for you! Armstrongs!!! I must have snapped up a zillion cashmere sweaters from there the last time I was in Edinburgh. Lovely, lovely shop. 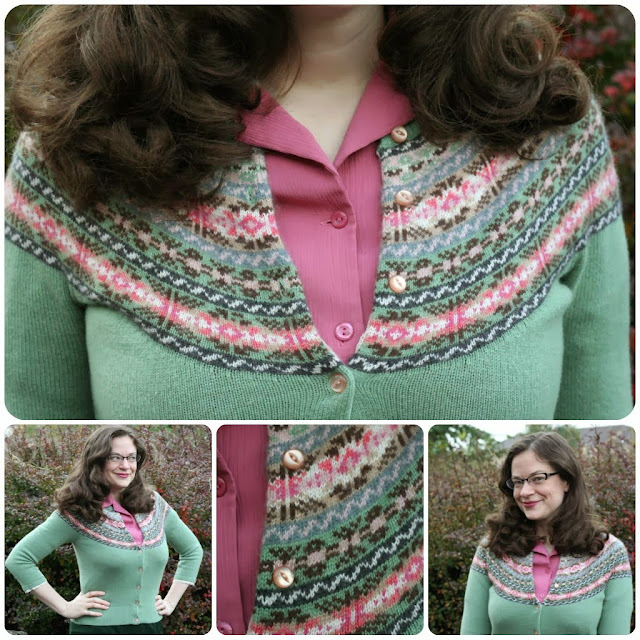 Your Fair Isle cardi is so pretty and I love the peach buttons. Beautiful glasses and sweater! I should work on my colorwork so I can knit something so beautiful! I have some vintage inspired glasses as well. Got them what 2 or 3 years ago. Love them. Never really got used to wearing contact lenses. Really like your sweater! I don't own anything real Fair Isle, but really like it. Have some pillowcovers I have made that is Fair Isle design, but without all the colour change. It just seems so difficult to change colour all the time! But I will get there, one day.. I have always used contacts but have developed eye problems. I looooove vintage or vintage style specs, and these are great ;) You look very sassy! Love the new glasses. I'm thinking of getting some retro specs myself here soon. And I'm super jealous of your minty cardigan! Love that color! Your new specs are very sweet, you look like your holding onto a delicious secret! Ahd what a coincidental cardi - I went to a Fair Isle workshop tonight to learn how to do Fair Isle knitting and I am hooked! Hope you get a chance to learn it too someday. Your glasses are very pretty :) and I am super jealous of your bargain!! I miss Armstrongs so much! I used to go to the Grassmarket shop all the time and every now and again the shop on Clerk Street. Is the Rusty Zip still open?? Cute frames and what a lovely sweater you found! You look lovely with your new glasses! Looking great Debi! And your hair is DREAMY! Love the glasses but also the history on the Fair Isle sweater. Your new glasses are great, they really suit you. Loving the colours in the Fair Isle cardi.